This is a learning module on ion engines, a newer rocket propulsion technology that uses electric fields instead of chemical or nuclear reactions for powering spacecraft. The ion propulsion system's efficient use of fuel and electrical power enable spacecraft to travel farther and cheaper than other propulsion technology. Students begin their tour with a tutorial on positive and negative charges, then progress to hitting targets using a charge simulator. Next, they look at multimedia materials that explain the inner workings of an ion engine. The activity culminates in an interactive challenge to design an ion engine using what has been learned. At each phase, teachers and learners are provided with background text, teacher guides, and explicit help with the fundamentals of charge interaction. This resource is part of NASA's Dawn project, whose goal is to shed light on the early evolution of our Solar System by investigating two large asteroids that have remained intact since their formations. 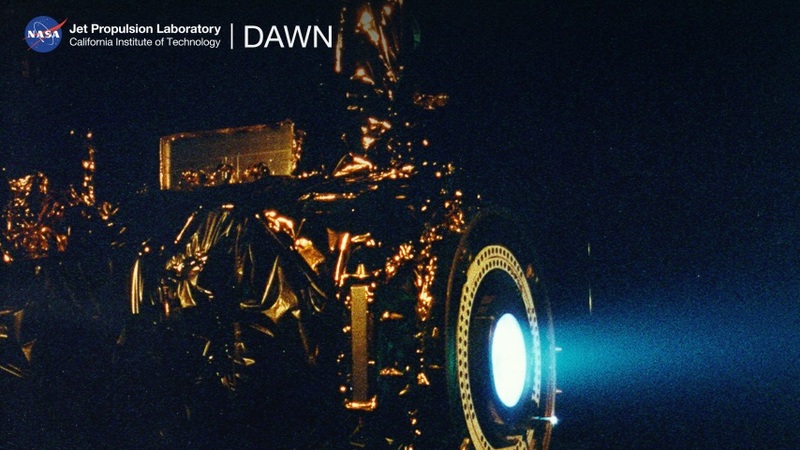 Dawn's spacecraft are powered by ion propulsion.